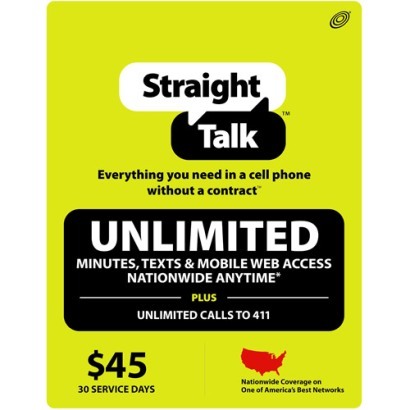 About a year ago, Straight Talk started to dominate the prepaid “trac phone” market when they started offering unlimited talk, text, and data (web surfing) for only $45 per month. Although the data (web surfing) aspect was a bit limited in its bandwidth capabilities, but the talk and text were unlimited – and for $45, that was (and still is) a pretty good deal by any measure within the mobile phone industry. Plus, Straight Talk amazing reliability as it is carried on the Verizon primary network. This week Straight Talk started to make their offerings just a little bit sweeter by offering a three, six, and one-year plan, on top of their monthly plan that is already in place. All of the Straight Talk plans include unlimited voice, messaging, mobile web, and 411, and they’re still $45 per month. Straight Talk is excellent! I was using them, then wanted a Blackberry Curve so switched to Virgin Mobile… that lasted two weeks into a month prepaid account when they locked my phone and internet account with no explanation. I couldn’t get even a remotely reasonable explanation from their minions in the Philippines so I ported back to Straight Talk and my raggedy ole’ Samsung R355C. Hate the phone, but love the service, and their support people really try to get things done!